Pizza Friday, originally uploaded by Seligman's Dog. A food tradition seems to be developing in our house for Friday night pizzas. I think it's because by Friday, we're exhausted from the week and Pizza's the easiest thing we can get to the table. 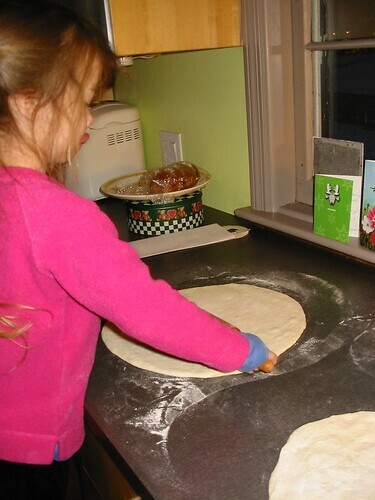 Frankie's been pushing out dough since she was about 18 months and she would pound out the focaccia. Although a true Pizzaioli would never use a rolling pin, but Frankie prefers one for now. Eventually, I hope she'll lose this crutch and start pushing and tossing the dough to a nice round. Soon, when I can track some down, we'll be investigating tipo 00 flour for this effort. Details to come.